Throughout the history, English was changing steadily. Not only was the English grammar, pronunciation or vocabulary being altered over the centuries but also the semantics of lexemes. A major factor that has a considerable impact on the semantics of words is the influence of foreign languages. This study deals with semantic changes due to the Latin influence on the English language in the Early Modern English period. The aim of the analysis is – with the help of the Oxford English Dictionary Online – to determine potential patterns of meaning alterations of English lexemes that were caused by the influx of Latin-derived equivalents, especially on the field of human anatomy, and between the 15th and the 18th century. Moreover, the Early Modern English period is portrayed as well as the roles of Latin and English during that time, also considering the integration of Latin loanwords into English. 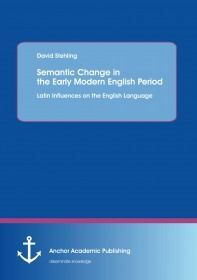 In order to discuss meaning changes due to Latin influences, a closer look will be taken at language modifications in general, at lexical change and at the various types of semantic change by which English words might have been affected.